Thanks to the imagination and to some engineering skills as well as to the help of a heavy crane, Kukuxumusu paid homage to Estafeta Street as it unfolded a gigantic T-shirt of 42 square meters in size. And it has done so just 24 hours before the Txupinazo y opening rocket goes off. 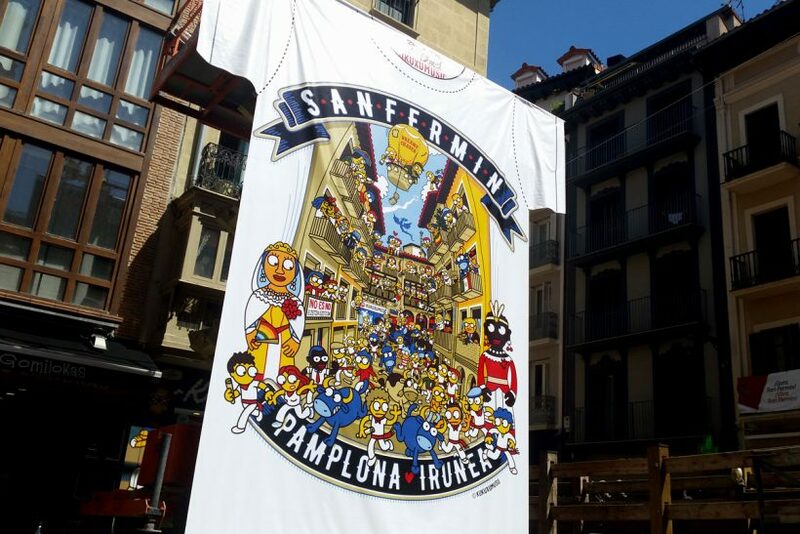 The firm wished to display its special drawing for Sanfermin 2017: with a perspective image of Estafeta Street right in the middle of the Running of the Bulls and containing a stack of their well-known characters in the drawing. Throughout its existence, Kukuxumusu has been drawing the fiestas from all kinds of different angles, but on this occasion, it has chosen perhaps the most emblematic and recognizable of all the fiesta events, that of Estafeta Street and the Running of the Bulls. And in doing so, it has produced a topical drawing filled with some of its own characters as well as some of the recent best-known runners and other contemporary figures such as councilor people currently in the news such as Armando Cuenca with his iconic Spiderman T-shirt and even Donald Trump, building a wall from a balcony on Estafeta Street. And in between all these, other figures both real and fictional such as Tyrion Lannister, photographer Pío Guerendiáin or the recently departed Fidel Castro and Julen Madina.